"I am a marvel with ten thousand arms." Dreg's Promise is an Exotic Sidearm that can be acquired in House of Wolves. 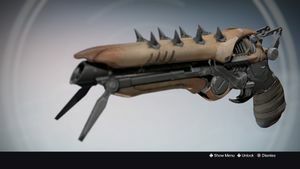 It is based on the Fallen Shock Pistol frequently used by Dregs. The Dreg's promise is one of three possible rewards for The Elder Cipher Exotic Bounty. The bounty is only available as a random reward for the level 34 or 35 Prison of Elders challenge modes. This weapon has a random chance of being acquired after completing Challenge of the Elders. Reserve Ammo: When you spawn with this weapon, you will always have ammo. Soft Ballistics: Less recoil. Less Impact. CQB Ballistics: Much, much recoil. Significant penalty to range. Aggressive Ballistics: Easier to control recoil, more recoil, less range, more impact. Grave Robber: Killing enemies using melee with this weapon equipped has a chance to refill magazine. Snapshot: You aim this weapon incredibly fast. Perfect Balance: Much less recoil. Shock Rounds: High ricochet shock rounds with enhanced target acquisition. Summary: This set of perks make the Dreg's Promise a close to midrange sidearm that works best in confined spaces. Although the Shock Rounds' ricochet effect isn't particularly useful, the enhanced target acquisition will definitely help the player increase accuracy, thus buffing its effective range. This will give the player an edge in personal defense. This weapon now fires tracking projectiles when the player aims down the sights to shoot. When Dreg's Promise was added into Destiny it was often nicknamed "Greg's Potato". The Exotic Sidearm isn't very similar to the originally used pistol by the Dreg's.Their pistol's shots can follow enemies, however the Exotic variant isn't capable to do because the shots are straight. The Dreg's Promise perks tree. Extraction of the Dreg's Promise.